The engine is the heart of your car, but just like the heart of a living thing, it can experience trouble that makes it inoperable. You wouldn't disregard chest pain, would you? While perhaps not as critical, it's important you don't deny car pains that are originate under the hood. If you encounter any of the following issues, it may be too late for small repairs and an engine rebuild may be necessary. Be sure to talk with a service professional who can help identify and fix the issue at hand to ensure that you get the right service for your vehicle. When you have the oil changed in your vehicle be sure to have the technician inspect the old oil. If they notice any metal flakes in the oil it is likely that there is excessive friction occurring between the moving parts of the engine. This often indicates that there is insufficient lubrication inside the engine. If you can hear a knocking noise under the hood that rises and falls in repetition with the engine RPMs, it's probable that the engine bearings are going bad. The bearings are what support the motion of the moving engine parts, so if the bearings fail, often due to wear and tear caused by age and poor lubrication. If your vehicle is producing blue exhaust smoke it is important that you visit a technician as soon as possible. Blue smoke is indicative of buning oil. This commonly occurs when the piston rings become worn, which results in oil seeping into the combustion chamber and being burned with the gas. If your vehicle is dumping large amounts of oil, your engine is suffering from insufficient lubrication. Even minor leaks can result in major engine wear and tear, as low oil levels will destroy interior engine components. If your car or truck has suffered a cracked engine block, you're definitely going to require an engine replacement. While cracked blocks are rare, they can occur, especially if a vehicle is subjected to constant overheating. If you believe your car is suffering from engine trouble, don't hesitate to visit a trusted auto repair shop. For professional engine rebuilding in Covina head to HyeTech Auto. 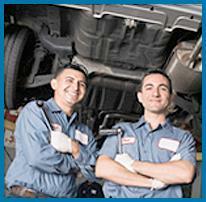 Our skilled technicians will conduct the necessary repairs to get you back on the road, fast! Give us a call at (626) 332-5452 to request an appointment for professional auto repair in Covina or the neighboring communities.